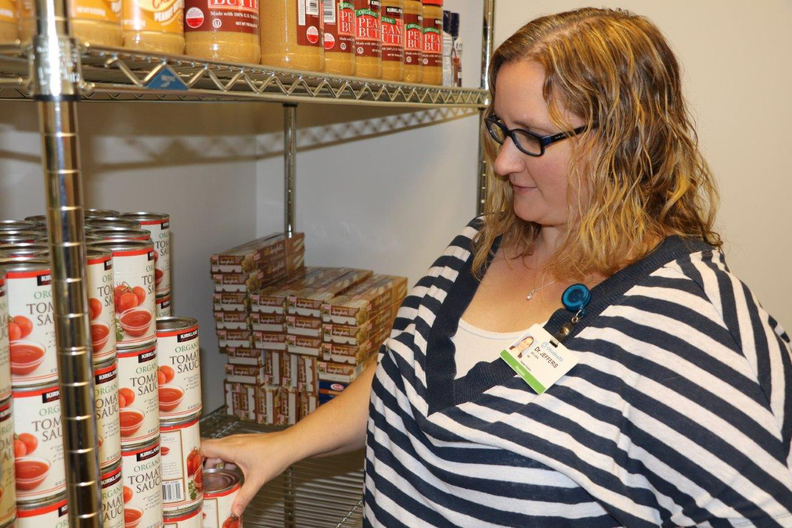 Dr. Melissa Jefferis of OhioHealth Riverside Family Medicine Practice Center in Columbus, looks over the office's stock of canned goods that it distributes to food-insecure, diabetic patients as part of its Food is Health program. Dr. Laurie Hommema, director of the medical residency program at OhioHealth Riverside Family Practice Center in Columbus, found the most proven clinical and care tools weren't cutting it when it came to managing diabetes among her lower-income patients. “With medicine, care management, pharmacists and dietitians, we had all of that in our offices already, and we just weren't seeing the outcomes that we wanted to see,” she said. So Hommema started looking at the kinds of foods patients were eating and found many lacked access to healthy fruits and vegetables where they lived. To make sure patients with diabetes understood the role food plays in managing their chronic conditions, leaders at Riverside's associated hospital, OhioHealth Riverside Methodist Hospital, partnered with a local food bank to distribute healthy food at doctor's visits. According to U.S. Census Bureau data, 21.2% of Columbus' population is at the federal poverty level. Nearly 80% of Riverside Center's patients are enrolled in either Medicare or Medicaid. Studies show many low-income diabetics often have to choose between purchasing food or medications. “It's hard to say if diabetics are food-insecure because they have diabetes or because they're food-insecure they are more likely to get diabetes,” Hommema said. OhioHealth's Food is Health initiative allows diabetics identified as food-insecure to take home up to 15 pounds of free fresh produce and canned goods for each member of their household once a week or every two weeks based on the level of need. The program is funded through the center's operating budget for its residency teaching program. Residents and medical school students advise patients on nutrition, food preparation and challenges to healthy eating. They also work on strategies to help them overcome those issues. From April through the end of July, 77 out of 175 patients screened positive for food insecurity. That rate of 44% is much higher than the national estimate of 13%. Hommema said 61 patients and their families are currently enrolled in the program. It's shown promising results, with patients losing weight and lowering their blood-sugar levels. Riverside is tracking patient data to see how the initiative has affected emergency department visits, hospitalizations and readmissions. Hommema hopes the program will eventually grow to address other chronic diseases and be offered to physician offices throughout the system. Funding remains a challenge. The program costs about $7 per enrolled individual every week. But that's still less than insulin, which can run about $300 a month. OhioHealth's current move toward value-based reimbursement offers some hope for additional funding. The system is enrolled in Medicare's Comprehensive Primary Care Plus initiative, an alternative payment model that rewards improved population health outcomes. “Since our outcomes will be better for our diabetic patients, we will hopefully find our funding from that program,” Hommema said.